This interview was conducted via email by Interview Editor Lian Ammerman. 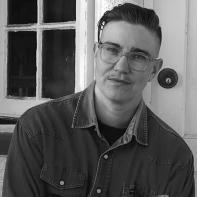 Of the process she said, “Jess Arndt’s short story collection Large Animals opens a vivid conversation about human bodies. She plays with liminality and anthropomorphizes objects throughout her stories to display the fluidity of being human. I appreciate her willingness to do this interview and I love how open and honest she is.” In this interview Jess Arndt talks about being free to move around in different voices, fitting stories into the collection, and being excited to hear about a sale on pinto beans. SR: It’s really interesting to see the ways you explore the relationship between language and physical material/bio matter. You mentioned the moment with the block of wood, and there are many other moments throughout the collection that feature objects that represent this sort of liminality. How do you decide which objects are the perfect fit for the ideas you are trying to convey in each story? JA: Hmmm, if I’m honest, I rarely think anything is a perfect fit, and am always sweating to make it express something just a little bit more. When it comes to language, it’s almost as if I push the words through my body to test them out. It’s effortful, and sometimes feels like being stuck in sludge. But I’m rarely satisfied unless a word (when thinking of words that represent the physical) is working on at least two or three registers at once. Maybe another way of saying it is that I don’t want language to be static, as if it’s purpose is to describe in 2-D—like you could paint it on. I want it to be felt, and if it’s going to be felt, I think I have to feel it first somehow? SR: In a couple of the stories, you seem to break the human body down into its most basic levels, cells and atoms. For example, in “Contrails,” the narrator mentions “writing books that made not just people but their cells cry.” Can you describe how these specific elements entered your stories? Jess Arndt: There’s a popular fantasy that we live inside of (i.e. are neatly contained by) our bodies and that our bodies basically behave, which makes existence seem like a cohesive and fairly comfortable experience. Anyone who suffers from anxiety (for instance) knows this isn’t the case—knows that one minute you can be walking around pretty tidily and the next minute, who knows why, your insides are pasted all over the sidewalk. To me, this is heightened by the experience of living at odds with my given gender—making my attempts at embodiment a chaos of conflicting parts. I think this has tuned me towards investigating language’s relationship to physical material/bio matter. In the story “La Gueule de Bois,” for instance, the narrator is suddenly staring through a face (theirs) that is actually a block of wood, that again begins to move like flesh, like tissue but seen from the outside. The macro and micro slide up against each other. The excruciatingly small; the inflated and large. It is hard to have a body, hard to be inside. SR: Each story is written from an ambiguous, first-person perspective. Can you talk more about this decision? Were there any challenges to writing this way? JA: Before Large Animals, I wrote an unpublished novella in the 3rd person, set in 1850’s San Francisco. The protagonist was similarly gendered to the bodies in this current book, but I called them “she,” which made me psychically flinch most times I did it. In Large Animals I felt freer to move around in the voices and in doing so, explore a series of motley experiences/associations. While I was writing, some moments tugged more male, some more female, some felt more “other,” less locatable, more third (or fourth or fifth). But all of them are mash ups of feelings I’ve had. The “ambiguous first-person,” as you so aptly put it, allowed me to flex or slide between positions, from one sentence to the next, without needing to explain myself or apologize. Another way to say it (your question helped me see this) is that I live my life in the ambiguous first-person all the time, am answering these questions from the ambiguous first-person, and so the book was less of a decision to try something on, and more like an attempt to scrape the other costumes away. SR. I’m so glad that you found a place for “Shadow of an Ape” in your collection. Were there any other stories that you had trouble fitting into Large Animals? Were there any you had to leave out? How did you decide which ones made the cut? JA: Ha, there were MORE Shadow of an Ape stories! At least, loosely related to “Shadow,” that is. We cut them out. One of them, “Serape,” just got published in this really interesting anthology called: Liberating the Canon: An Anthology of Innovative Literature, gathered by Isabel Waidner, who is working out of London. I was happy to see it found a home. But otherwise, it takes me so long to write a story that we needed anything we had. In fact, I had the lucky opportunity to work with my editor Julie Buntin to write a last minute story for the collection (“Beside Myself”), that slipped in after the book was already in process. Part of why this was lucky is because book making takes so long from start to finish that it’s easy to become disengaged from the work, or feel as if what’s published is somehow from an “older” (or I guess you could say, “younger”) you. “Beside Myself” felt fresh, and a little scary. I was grateful for that. SR: The story “Shadow of an Ape” takes place in San Francisco in 1860. This is the only story where the time period is explicitly given, and it’s a time period that seems far different than the rest of the stories. Can you discuss the reason to include a story from such a different time? What kind of research did you have to do in preparation for this particular story? JA: “Shadow of an Ape” is a funny story to me, because writing the first draft was completely enjoyable. While doing it, I felt so loose. This is because I’d finished the SF novella, and I knew I was moving on from it. But I still had that (19th century Gold Rush) world floating around in my brain. The new story didn’t have to represent everything I’d been thinking about re: gender + bodies. I kind of let that get quiet. And instead what popped up was this dude who’s so at odds with his surroundings, so out of tune with himself, so stubbornly non-self-reflective/blind. Suddenly it wasn’t so fictive. I found myself in there again, dodging my own ape. That was the easy part. Including it in the collection was harder. I knew it had to be there, for my own self as much as for any reading audience. But giving the readers enough clues to land them in the time period I was steeped in, without overloading it with description, was an uphill struggle. My editor and I were basically always on the same page throughout the book-editing process, but we did sweat a bit about Shadow. SR: I find it fascinating that you were able to create “Shadow of an Ape” from the world you had envisioned from the novella you wrote before Large Animals. How do you go about taking a similar idea and making something completely new from it? Is this something you find yourself doing often with your stories? JA: Good question, and I think the answer probably is: no, I’ve never done that before! It all came out in a flood of relief not to be working on the hard thing—ie., the novel about Gold Rush SF. In fact, that was the problem with the novel to begin with. That it was trying too hard to be ABOUT something. That said, I’m always trying to make new things out of old things, when the old things don’t work. Sometimes I’ll change the tense, or the POV, and write the story again just to see how it feels. Sometimes I’ll steal a line from a story attempt that feels like it’s not working, and try to use it to ferment something new. Anything that does work, ie, that survives, is basically a Frankenstein of old parts. SR: There are some really interesting moments in different stories where you give inanimate objects human qualities, “the refrigerator’s chilly rib cage,” and “the room’s armpit,” for example. Your collection delves into the relationships between humans and their bodies; what is the connection between those bodies and the objects that populate their world? How did these human-like objects work their way into your stories? JA: I have a deep tendency to anthropomorphize, meaning objects in my life really do feel like sentient beings. It’s almost the inverse of what you describe, ie. “the human-like.” Instead, there’s an excruciating humanness to everything. Except (and here’s me being very honest/melodramatic), maybe me. If you let it be, it’s so blurry, all these distinctions and categories—between genders, between species. Deep down I prefer life without them. SR: Can you explain the process of creating this collection? How did you piece each story together to create Large Animals? JA: The other day I was talking to my best writing bud, who is three-quarters of the way through writing a new collection. Inevitably, when addressing your manuscript, you turn to the almost surgeon-like question: “but what does it need? ?” Since you are talking about life, about the collection’s ability to come alive or not, the question is always vital. At least that’s how it was with Large Animals. I’d been living out in the California desert, often talking to no one for days at a time except my girlfriend, and even there, the cell phone connection was bad. Looking at the manuscript, I was sure I’d written the same story 12 times, or alternatively, that the stories were too ridiculously different in their DNA to be together. I’d cycle around. It was always one or the other, or both. Are you ever going to come to LA? my girlfriend would say. Coming to LA was kind of like: the book is done. Of course! I’d say. But I had no idea how. Thankfully, around that time, a faint but strengthening string of magic people emerged who trusted that the individual pages meant something all together, and that trust basically allowed the book to be. SR: You’re a co-founder of New Herring Press, which publishes books that combine the work of writers and visual artists. This is a concept that I find really fascinating. Can you talk about the ways visual art and written prose compliment each other in the books? JA: So glad you think so! When we started New Herring, we did so because we were four friends and prose writers (in that order), who spent most of our time around artists and poets. At that time in the prose world, small press publishing was unicorn-like. At least it seemed that way to us. Poets were making chapbooks, artists were having outside-of-gallery shows. We felt kind of stuck. We didn’t want prose to be solely determined by larger presses looking for the next big commercial hit. I come from an MFA culture (at Bard College) that is deeply rooted in the visual arts. As such, again, the categories between things felt very diffuse. We wanted to interrogate the idea that there has to be a hierarchy between image and text. And we were making the books for readers who also felt this way. So if we published four writers and one artist, per round, we wanted the artist to be a fifth—equal—voice. This feeling continued into Large Animals. My best reader in graduate school was the painter and painting teacher, Amy Sillman. Her drawing is on the cover of the book. SR: You received your MFA from the Milton Avery Graduate School of the Arts at Bard College in New York, and you currently live in Los Angeles. How does living in different places impact what you write and how you write? JA: Each place has its cadence, its energy. My writing usually comes from planting little, loud, impossible-to-predict-where-you’re-going-to-find-them seeds. Sometimes they show up (overheard) on the subway, or maybe from something that happens on the street. Over the course of a day, if you’re lucky, some germinatable thing plants or sticks. In some ways, New York is so fertile. You’re always rubbing up against something possible. But in the desert, I’d go all day without speaking. That was a different kind of gathering. “Sale on pinto beans, aisle three” sounds really good when you’re starved for communication. I’d gush to the person bagging groceries, the gas station dude, the beer store cashier. Then drive home, down all these scrubbed, moonscape-like desert roads, with my heart banging, thinking: “what have I done, what have I said?” Really, you can make a story about anything. JA: Ha! It’s a shack stapled on the back of our house, and since we live in Los Angeles, which is not flat, but actually composed of a lot of mini-canyons, the shack is falling down a hill. But I love it. It’s got a built-in plywood bed, a built-in desk, and built-in bookshelves. It’s like a ship, with view of palm trees. During the day our cat dissolves in and out. At night it’s raccoons on the roof—and—when the universe decides I’m really supposed to hunker in my studio, outside my door: sentinel-like skunks.